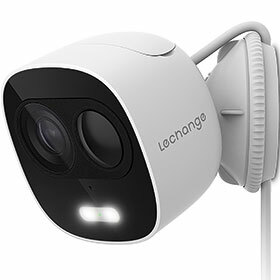 Lechange, a brand from the Dahua stable, has launched LOOC, its new active deterrence Wi-Fi camera. With an advanced PIR detector, built-in spotlight and 110 dB security siren, LOOC is not only able to provide proactive warnings, but also help create a safer environment for households and businesses. LOOC aims to take preventive measures for its customers that not only record the crime-scene evidence, but also drive away threats before anything happens. Supported by a high-quality PIR sensor with the sensitivity up to 10 m, LOOC enables detection in detail and effectively reduces false alarms. It also sports a built-in motion activated spotlight and up to 110 dB security siren. Aside from providing 2 MP live monitoring, LOOC supports H.265 compression, enabling good video quality while minimising storage space and bandwidth by up to 50%. Dual internal antennas improve the 2.4 GHz Wi-Fi signal and the built-in speaker and microphone enables remote communication with people in front of the camera. LOOC alerts customers via a notification to a smartphone, with live video available wherever there is an Internet connection. At night, the automatic night vision mode and advanced IR algorithms offer clear pictures in complete darkness. The system can handle diversified video storage options, such as SD Card (up to 128 GB), NVR or cloud storage, making it easier to access and use the footages. It also provides flexibility for consumers in different application senarios. With its IP65 weatherproof design, multiple bracket options and different colours of durable silicon rubber skins, LOOC can easily handle outdoor surveillance and blend into various environments.